The search for a murder suspect with local ties continues. An earlier-than-anticipated retirement lends urgency to questions about the future of Montague’s Water Pollution Control Facility staffing; our editorial calls for transparency in the process. 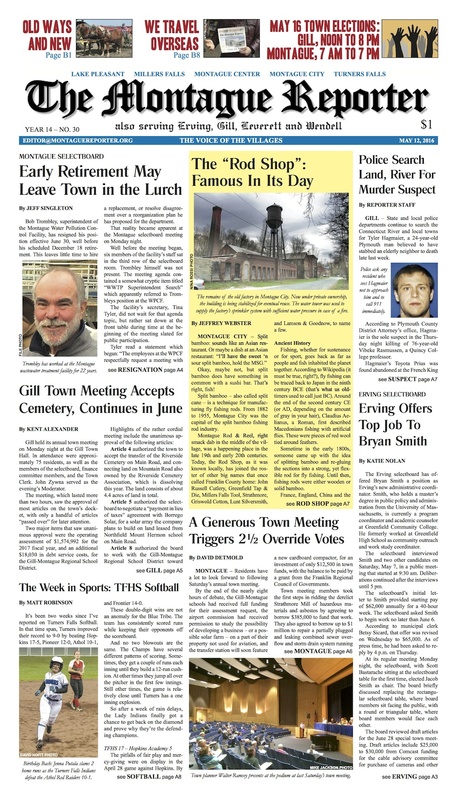 A cordial Gill Town Meeting approves most articles, while a generous Montague Town Meeting dips into savings to fund initiatives and requests. Erving’s selectboard elects a chair and makes an offer. Wendell’s selectboard re-elects its chair and judges an essay contest. Turners students teach younger peers about social media. A bevy of letters and editorials endorse candidates for local office. The latest on TFHS softball. And, a look back at the famous-in-its-day Montague Rod & Reel. MoRe: Plow Day draws a large, friendly crowd to Northfield. Last Dance Shrouds offer a simple, soft (and green) good-bye. West Along The River deems May “a pious fraud.” Energetic paintings fill the Wendell Free Library’s gallery space. Oystergirl offers up Part 2 of “The Surprising History of Menstrual Care.” In Montague Center, good music makes good neighbors. Our farmer’s market beat profiles the fashion choices of one stylish young locavore. The Healthy Geezer offers an environmental scan. Pets of the Week Daredevil and Angel Kitty seek a spot on your couch. The Gill Police Log finds bridge workers using vulgar language, while the skunk in the Montague Police Log just stares back. This month’s Children’s Page walks you through turning a newspaper into a paper bird. 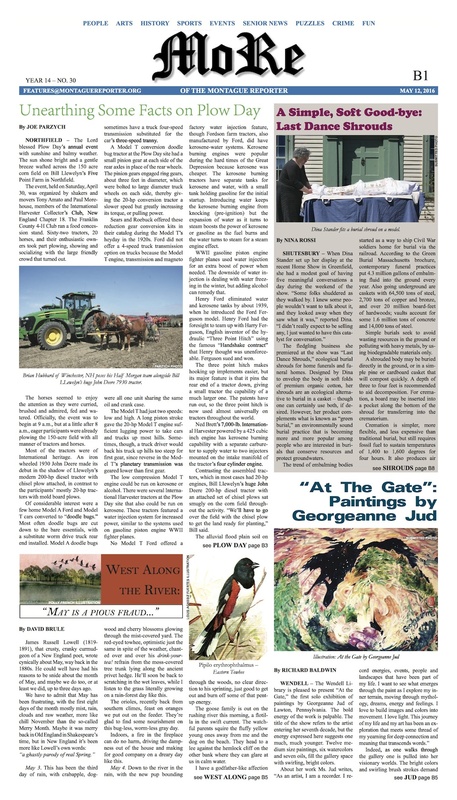 Plus: arts, events, the Great Falls Middle School honor roll, and a Reporter sighting in Rome.